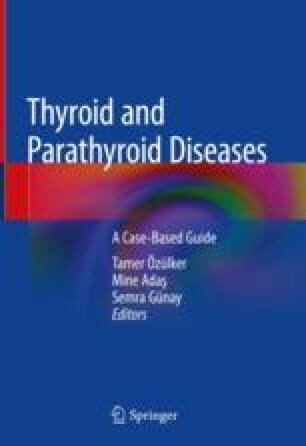 Primary hyperparathyroidism (PHPT) is the most common cause of hypercalcemia and is characterized with high (or in the upper limit of normal) parathyroid hormone levels despite the presence of hypercalcemia. PHPT diagnosis is becoming more common in the recent years due to frequent measurement of serum calcium levels in routine biochemical screening. The most common clinical presentation of PHPT is asymptomatic hypercalcemia. However, a broad range of clinical manifestations such as osteoporosis, skeletal manifestations, or nephrolithiasis may be seen as the disease sets on.